JUDGMENT of our female contemporaries is certes by no means an easy matter. After having run through the history of the Frenchwomen of this great nineteenth century — across fashions, manners, anecdotes, through all its little picturesque and seductive districts — we have scruples in approaching this dangerous physiology of the modern woman. To speak the truth, to manage properly so complex a study, we must undertake it boldly, in the fashion of our ancestor Restif de le Bretonne (1), who, better than Brantôme, (2) consecrates to the romantic analysis of the ladies of his time more than forty volumes, in which he hesitates not to catalogue the Parisian ladies of the eighteenth century, in the different classes of society, from the top to the bottom of that ladder which the Revolution was to turn upside down. But here we study not, scarcely do we look in the face of the silhouettes which pass by, to note in a lively manner some small details seized in the prism of costumes and fashions. The female contemporary, under her diverse aspects, realistic romance writers are on the spot to give her in detail, with all unhealthy complaisances and all improper perversities; they quit her not …; these amiable vultures ransack her palpitating flesh, and expose her nerves, her heart, and her brain. They have shared among them the inheritance of Restif. Some have laid their claws on the lower parts of our “female contemporaries of the common;” others, more eclectic, dissect at leisure the courtesan or the woman of the world; others, again, who set up pretensions to the Comédie humaine, run through the “graduated female contemporaries” in all their tints. If we are to believe these demoralising moralists, the Parisienne of this end of the century would be a little monster no less of a rogue than of a coquette, cruel to an unheard-of degree, and so essentially governed by her senses and her libertinism that we must never think of trusting her with our faith, our heart, or our repose. We have sometimes, we must confess it, a better opinion of our fellow-citizenesses, and, beside them, of certain women who are but the giddy products of nature. We think, with Goldsmith, that the modest virgin, the reasonable spouse, the prudent mother, are far superior to all the women who fix the attention of the world, to all the heroines of romances whose sole occupation is to assassinate humanity with the arrows of their wit or the looks of their beautiful eyes. We have been able, in a preceding work, to speak straightforwardly of la Parisienne moderne (Son Altesse La Femme. Paris, Quantin, 1885. 2 N). We have regarded physiologically that feminine aristocracy which is not to be found in its true mean except in a great city. We cannot to-day recur to this subject, and we will only regard our female contemporaries from the special point of view of psychology and taste, allowing ourselves at the same time a very sober résumé the different circumstances which have principally favoured the blossoming of the manners of the day. (1) Rétif de la Bretonne (also Nicolas Edmonde Rétif de La Bretonne), 1734-1806 was a French novelist and pioneer of realism and naturalism. (2) Pierre de Bourdeille, seigneur de Brantome (1540-1614) was a French writer in the Renaissance. He gave in his memoirs (eg, “The life of the gallant ladies”, issued 1665), a vivid picture of French aristocratic society of his time. 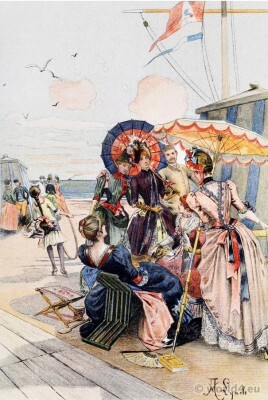 From the Book: The Frenchwoman of the century; Fashions – Manners – Usages, by Octave Uzanne. Illustrations in water colours by Albert Lynch. Engraved in colours by Eugène Gaujean. Excerpt of the Chapter: FEMALE CONTEMPORARIES. THE END OF THE CENTURY.